Choiseul defeated Isabel 2 – 1 in a reflection of the score line when the fixture was called off due to bad weather on Monday. Moffat Sikwa’ae scored Choiseul’s opener in the 9th minute before Coleman Makau put them 2 nil in front with a shot from the halfway mark just 2 minutes later. Isabel made sure they got on the score cards with Junior Tivo’s header from a free kick just before half time but they were not too worried about catching up because they also qualified for the semis the day before. As per today’s results the first semi final fixture is between Group A leaders Malaita and Isabel who sit second in Group B and will be played at Lawson Tama stadium with the kickoff time set at 1:00pm tomorrow. 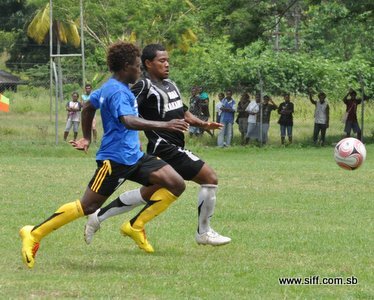 Malaita confirmed their place in the semis on the back of a 3 – 1 win against Guadalcanal yesterday. The second semi final is between Group A runners up, Honiara, and the impressive Choiseul side who topped Group B with their confident performances against both Isabel and Central Islands in their pool matches. This match will kick off at 3:00pm tomorrow and will also be held at Lawson Tama stadium. The grand final and third/fourth playoff are currently on schedule to be held on Saturday.